Professor Janice Robertson will attend the Southeastern College Art Conference in Savannah Georgia November 9-12, to present her paper, “VoiceThread Class Projects turn Text-Based Teaching on Their Head”. Considerations of image/text relationships are fundamental to art historical research, but rarely do we scrutinize our own teaching practices in these terms. At what point do art objects start functioning as illustrations of our teachings? I would suggest that this happens at the point where students stop seeing and thinking for themselves. We know how to engage students in seminars, but what’s happening in our introductory/survey courses? 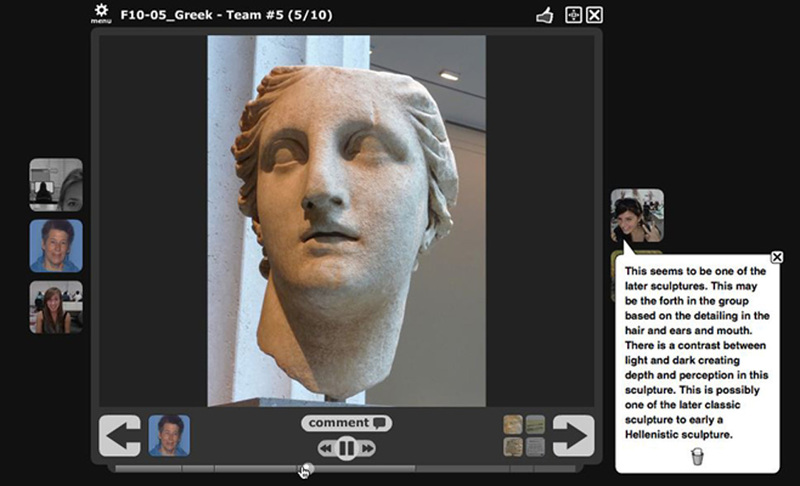 This case study, based on the teaching of an Art History Survey I course in the History of Art & Design department at Pratt Institute, shows how two VoiceThread class projects worked to immerse students in visual material that was unencumbered by any particular text: challenging them to engage directly with images of the objects under investigation, and to solve art historical problems of style and meaning. VoiceThreads are a form of online multimedia technology that begin with pictures, record comments (audio, typed, video and graphic), incorporate url links, and play out as asynchronous conversations. Listen to Professor Robertson’s talk at the 2011 CAA conference. The VoiceThread for this presentation can be seen here.